Andreas Mougholias is a second-generation restauranteur. Andreas and his family have owned and operated restaurants in the Kamloops area going as far back as 1975. We offer a wide selection of dishes! 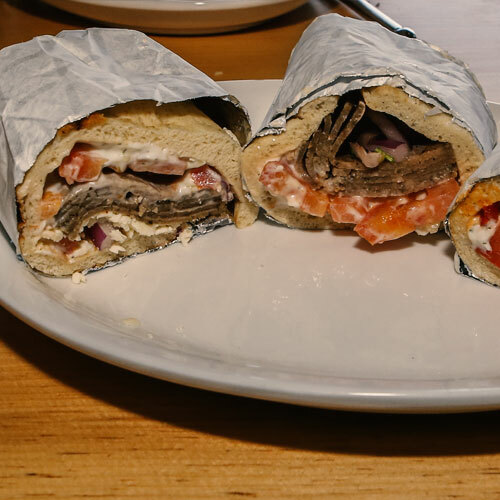 The Greek Kouzina offers a wide selections of delicious dishes from, Pizza, Pasta, Authentic Greek Cuisine, Gyros and Shareables. 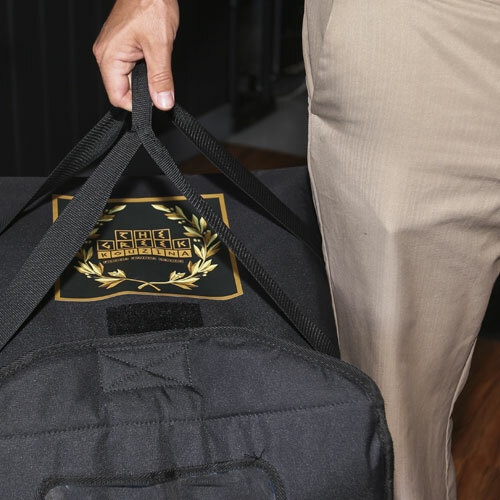 Whether you’re having a party, a lunch meeting or a gathering for a big game. 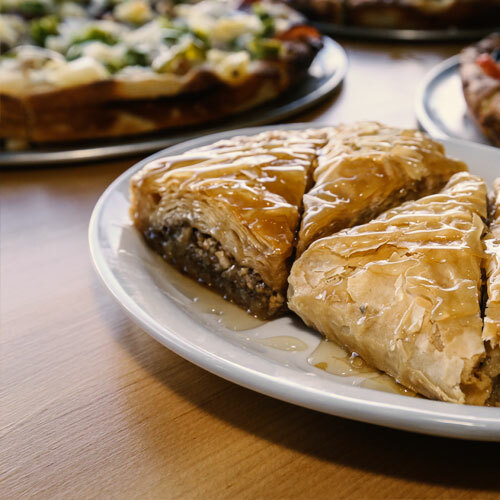 Feeding the whole crew is easy with The Greek Kouzina! Reviews & Recommendations from some of our happy customers! We just ordered a pizza from you guys and it was fantastic!!! but then again it ALWAYS is…. Thanks for always being so dependable!! Your service is quick and super friendly!! Thanks so much!! Tough to find a good value, authentic gyro in this country, but fortunately The Greek Kouzina has absolutely nailed it. It was like being back in Piraeus. Will be returning again and again, looking forward to trying everything else if they’re on par with your pitas. Wow! I thought I’d try this place out as it was close to our place in Sahali. Ordered a medium The Greek pizza and a couple donairs because I can eat a medium pizza to myself… I thought. Food was amazing and so filling. I probably could have made two pizzas from the toppings on it and the donairs were amazing. Needless to say we weren’t able to finish it all. Amazing value and great food at this gem. Highly recommend. Ordered pizza for my staff meeting was absolutely an excellent delivery service. Price point for what u get is a plus! Absolutely delicious. 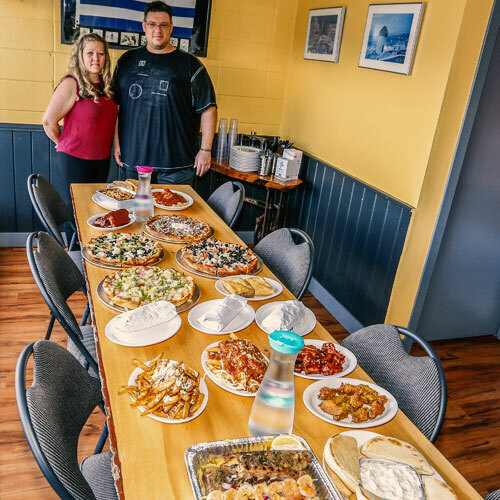 Will definitely recommend this restaurant to family, friends, and travellers passing through town, hockey tournaments, all sports related – the menu is exquisite!! So so so good! Massive portions with enough for leftovers tomorrow. Lasagna is definitely recommended and so is the pizza! I loved the huge amount of feta in the greek salad. Great customer service as well. The absolute best pizza I have had in years! Very consistent with lots of toppings and a decent crust. I have been ordering weekly for the past couple months and it’s always been great! Very friendly delivery drivers add to the experience. I recommend you give it a try, I’m sure you will not be disappointed. OFFERING DELICIOUS DISHES FROM PIZZA, PASTA, AUTHENTIC GREEK CUISINE, GYROS AND SHAREABLES. WE HAVE SOMETHING FOR EVERYONE! Menu items and prices are subject to change without notice. Prices do not include GST. Delivery charges & minimum order apply. Limited delivery area. AVAILABLE 7 DAYS A WEEK, FOR PICK-UP OR DELIVERY! Served with Pita & Tzatziki. 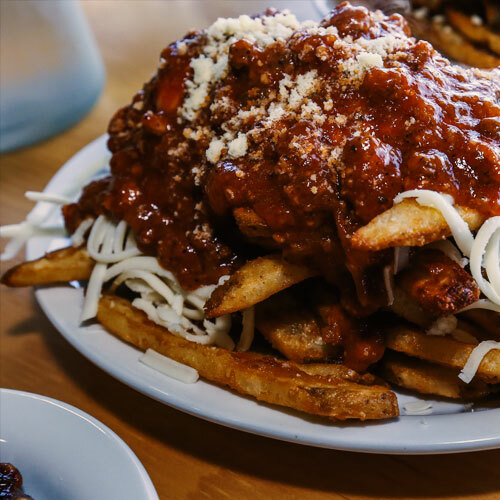 Meat Sauce, Beer Batter Fries, Parmesan Cheese & 100% Mozza. Feta, Beer Batter Fries, Oregano, and Lemon. Served with 2 meat balls. All items served with Garlic Toast. Beef, Tomato, Onions & Tzatziki. Chicken, Tomato, Onions & Tzatziki. Beef, Tomatoes, Onions, Feta & Tzatziki. Chicken, Tomatoes, Onions, Banana Peppers, Tzatziki. Greek Pilaf Rice, Lemon Potatoes, Feta, Tomato, Onions & Tzatziki. Chicken, Beef, Cheddar, Feta, Banana Peppers, Tomato, Onions, Hot Sauce & Tzatziki. Our dough is made fresh daily. Covered with our zesty homemade signature sauce and 100% real mozzarella. 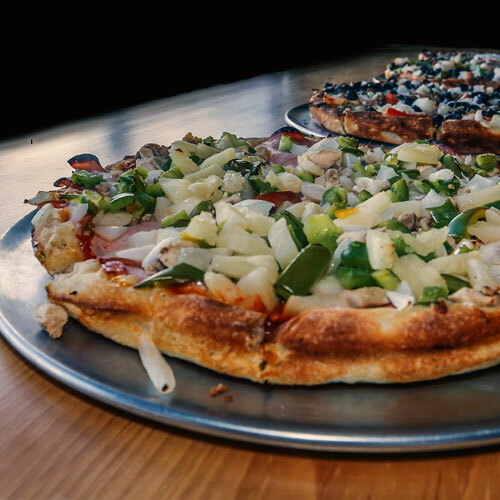 Loaded with fresh toppings and baked in our traditional stone ovens. Salami, Mushrooms, Bacon, Onions, Green Peppers, Black Olives, Shrimp, 100% Mozzarella & Signature Pizza Sauce. Feta Cheese, Fresh Tomatoes, Onions, Black Olives, Sprinkle of Oregano, Garlic, 100% Mozzarella & Signature Pizza Sauce. Pepperoni, Mushroom, Italian Sausage, Onion, Green Peppers, 100% Mozzarella & Signature Pizza Sauce. Ham, Chicken, Onions, Green Peppers, Pineapple, 100% Mozzarella & Signature Pizza Sauce. Beef, Bacon, Mushroom, Onions, Sprinkle of Cheddar Cheese, 100% Mozzarella & Signature Pizza Sauce. Feta, Cheddar Cheese, Parmesan, Double 100% Mozzarella & Signature Pizza Sauce. Pepperoni, Salami, Ham, Italian Sausage, Bacon, 100% Mozzarella & Signature Pizza Sauce. Pepperoni, Mushroom, Ham, Pineapple, Sprinkle of Cheddar Cheese, 100% Mozzarella & Signature Pizza Sauce. Beef, Feta, Fresh Tomatoes, Onions, Black Olives, Oregano, Garlic, 100% Mozzarella & Signature Pizza Sauce. 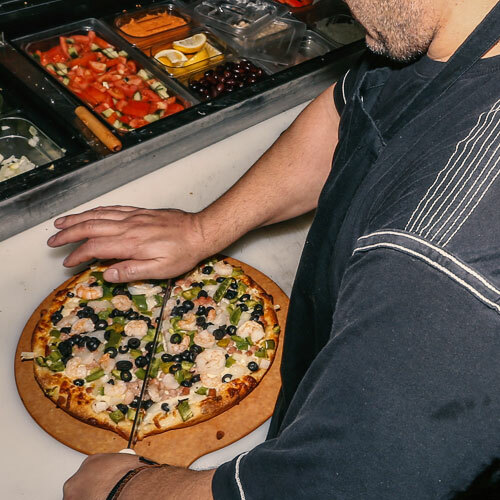 Mushroom, Fresh Tomatoes, Onion, Green Peppers, Black Olives, Pineapple, 100% Mozzarella & Signature Pizza Sauce. Beef, Italian Sausage, Onion, Parmesan Cheese, Sprinkle of Cheddar Cheese, 100% Mozzarella & Signature Pizza Sauce. Chicken, Bacon, Onion, Pineapple, Banana Peppers, Sprinkle of Cheddar Cheese, 100% Mozzarella & BBQ Sauce. 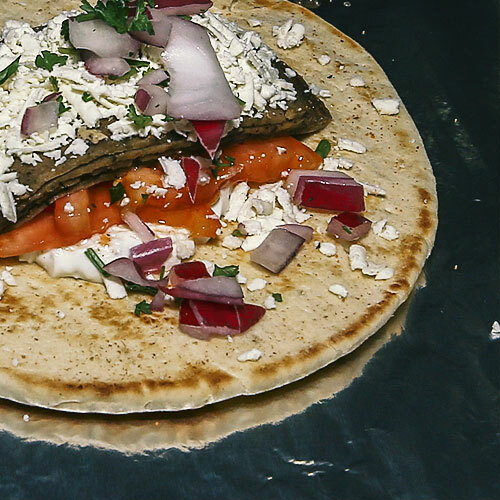 Gyro Beef, Feta, Red Onion, Fresh Parsley, Oregano, Garlic, Tzatziki, 100% Mozzarella & Signature Pizza Sauce. Our delicious meat sauce is made from scratch. Using quality ingredients and simmered to perfection! Served with Garlic Toast. Half Tray Greek sized Lasagna. Served with 4 pieces of Garlic Toast. Feeds 3-4 people. 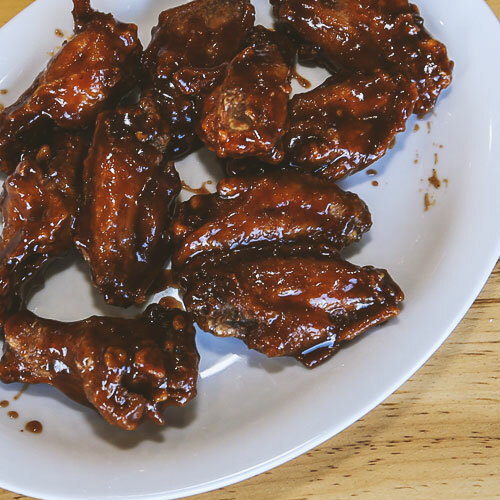 Lemon Pepper, Salt & Pepper, Hot, Honey Garlic, Teriyaki, BBQ. Served with Baked Lasagna & Garlic Toast. Marinated in a Tomato Puree, oven baked and finished off with a Spicy Sauce. 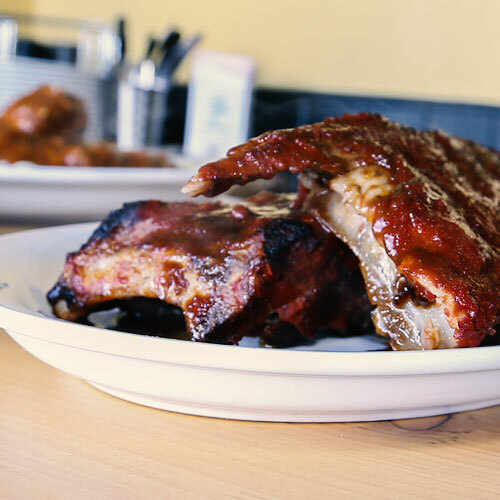 Charbroiled, then baked with our honey infused barbecue sauce. Served with Greek Pilaf Rice, Roasted Lemon Potatoes, Greek Salad, Pita Bread & Tzatziki. Charbroiled and brushed with fresh garlic, oregano and lemon. Oven baked with garlic butter and seasoning. Tender chunks of chicken marinated and charbroiled. Tender rings of kalamari lightly floured and fried. Chicken, Prawns, Greek Ribs, Kalamari, Greek Pilaf Rice, Roasted Lemon Potatoes, Greek Salad, Pita Bread & Tzatziki. Serves 2-3 people. Stop into Fratelli Foods, Every Wednesday between 11:30am - 1:30pm and grab a DELICIOUS Chicken Souvlaki Lunch. From The Greek Kouzina for only $8.99! 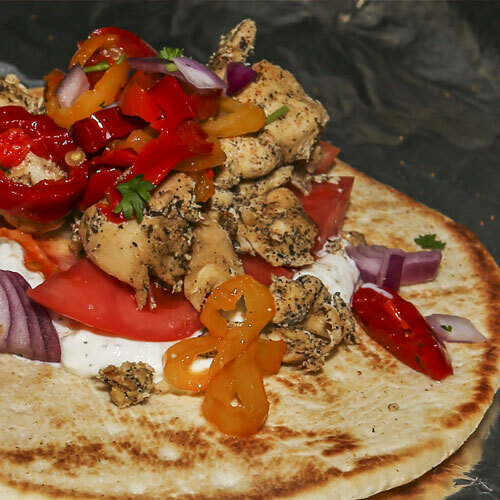 Stop by Fratelli Foods, Every Wednesday between 11:30am - 1:30pm and grab a DELICIOUS Chicken Souvlaki Lunch. From The Greek Kouzina for only $8.99! The Greek Kouzina shared a French Bulldog Loves Pizza But Isn't Allowed.